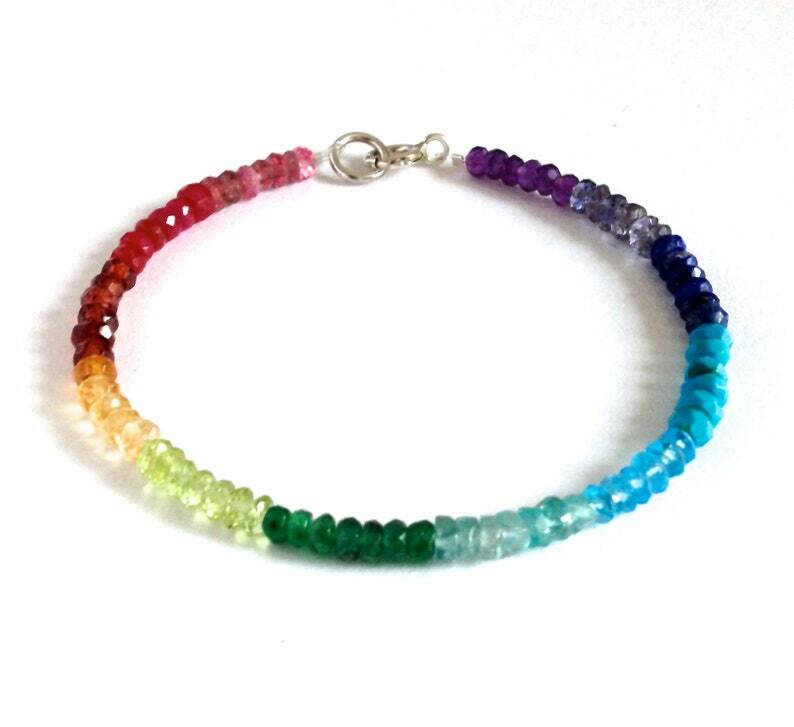 A boho chic, upscale colorful genuine rainbow gemstone bracelet. pink tourmaline, garnet, ruby, amethyst, iolite, lapis lazuli, turquoise, topaz, aquamarine, citrine, peridot, emerald. These gemstones range in size but are generally about 3-4mm in size. Select a gold filled clasp or 14k solid gold clasp or sterling silver clasp. This bracelet is strung with nylon coated steel wire which is very durable yet flexible. Choose your custom length. This bracelet will arrive gift wrapped. Rainbow Necklace. 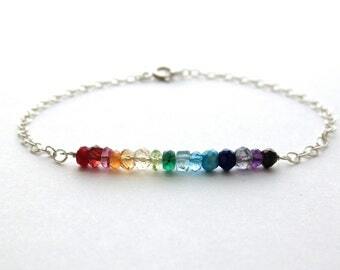 Sterling Silver Rainbow Gemstones Necklace. Multi Gemstones Bar Necklace. Crystal Earrings. Colorful Watermelon Tourmaline Earrings. Colorful Quartz Earrings. Colorful Rainbow Sterling Silver Clear Quartz Earrings. Rainbow Necklace. Rainbow Gemstones Necklace with Gold Chain. 14k Gold Filled Colorful Genuine Multi Gemstones Necklace. Blue Lapis Lazuli Gold Pendant with Watermelon Tourmaline. Dark Blue Green Malachite Genuine Gemstone Pendant. Rainbow Gemstones Necklace.